It has been said that being a pilgrim is different from being a tourist. A tourist visits a place with a limited purpose for a limited amount of time. We may go to rest, play or learn something new. Being a tourist is wonderful but it has its limits. Contrast this with being on pilgrimage. A pilgrim travels with an openess to begin changed, to being stretched. A pilgrim knows that there is always a price to pay. The price of moving outside one’s comfort zone, of being surprised in ways both pleasant and challenging. The tourist goes to be comfortable. The pilgrim expects to be uncomfortable for the sake of a greater good. 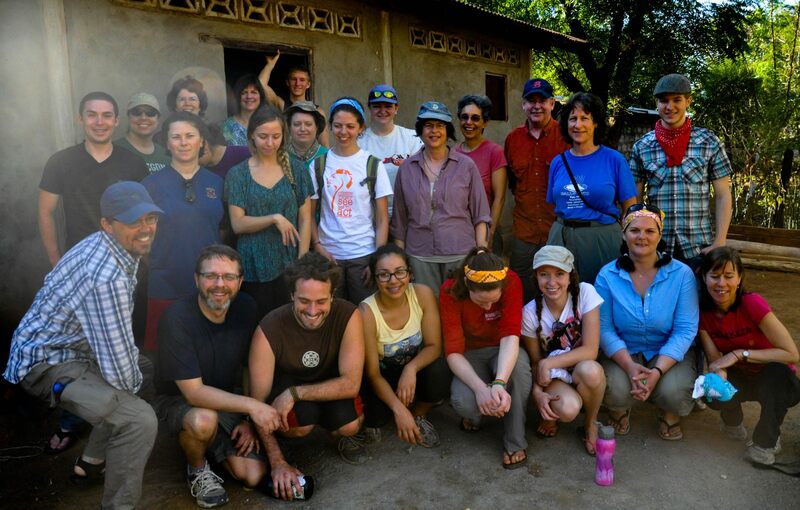 This past week I was on pilgrimage to Nicaragua with a group (pictured above*) from First Baptist and Chemeketa Community College www.chemeketa.edu . We travelled to the village of La Pimienta, an isolated community in the region of Chinandega, near the Honduran border. There our team worked with the local health committee to provide health screenings, testing of water samples and repair of water filters. Sure we helped some. But in return we received so much. We were inspired by the hospitality and loving embrace of the La Pimienta community. We came as strangers and left as friends. For some of us it was an opportunity to reflect upon the impact of faith on daily life. Many of us were deeply moved by how foundational faith is to the meeting the challenges that confront the leaders and people of La Pimienta. In the midst of staggering poverty and a harsh climate the people persevere, they continue to work for a better tomorrow for the sake of their children. Their faith both sustains and inspires them to continue. In partnership with AMOS a ministry of health www.amoshealthandhope.org the people of La Pimienta have hope. Such a witness inspires me. I find myself looking at the context of my own life with fresh eyes. If the people of La Pimienta can persevere when they have so little, then how can I not persevere when I/we have so much? How can I not work for the cause of health and hope in my own community? None of us who were on pilgrimage to Nicaragua returned the same. We were challenged both physically, emotionally and spiritually. From these moments of challenge will come lessons and blessings that otherwise would not have been ours. This Holy Week each of us is invited to go on an interior pilgrimage where we open ourselves to the guiding of God’s Spirit. A reading of Matthew 26 – 28 will remind us of Jesus’ final week. With the openness of a pilgrim we may find God breaking open our heart, mind and imagination in some surprising ways. I wish you well on the pilgrim way. Wherever the path may lead. Thanks Rob, I read another of Cavanaugh’s books on pilgrimage and found his thoughts on ‘how to prepare for pilgrimage’ as very helpful. Love the title of your thesis. Have a good Holy Week. I’d like to read your thesis if you care to send along. All the best. Cavanaugh is an engaging writer. I’m really enjoying your posts, Kent. They’re always substantive and thoughtful. I’ll forward my thesis via Facebook message I think. Cheers. Kent, Good article. I find it so much safer to live life as a tourist. Too live as a pilgrim cost me something. My time, my energy, and most difficult of all, my vulnerability. Thank you for the “push” to move towards a pilgrim life. Trudy, I agree it is soooooo much easier to remain a tourist. More times than I care to recall, I choose the safety of the tourist. But once in awhile, in community with others, I find the courage to ‘step out as a pilgrim’. The beauty of a church is that we have the opportunity to support one another in stretching beyond our comfort zone…and there we are supported by God. Trudy, I’m so glad you are at FBC!